Sue Briggs, NSW DECC - Summary of Presentation to EIANZ Conference. New South Wales has just introduced a voluntary Biobanking scheme through parliament. The legislation allows developers who meet avoid-minimise-offset requirements to compensate unavoidable residual impacts through investment in a market-driven credit scheme for biodiversity. The scheme, which mirrors similar programs in Victoria (Australia) and also South Africa, the US and increasingly worldwide, augments a more traditional form of biodiversity management based largely on qualitative measures of habitat importance and threatened species. As with many such schemes, it was open to costly legal challenge and offered little certainty for developers. The outcomes were often inconsistent and resulted in legal debate and court cases. For instance, in one example, a developer was required to sieve tonnes of soil to establish whether the seeds of a threatened plant were present. In another case, just one tree was enough to prove the presence of a threatened community (read the full article by Judith Rawlings). There are countless examples in the media. Arguably, money could be better spent invested in real biodiversity outcomes in habitat that is substantial enough to maintain viable populations. Biobanking is an alternative approach that "improves or maintains " biodiversity and recognises the principles of biodiversity that now underpin regulatory instruments in New South Wales. Biodiversity encompasses structure, function and composition of ecological communities at site, regional, state and national scales. Examples of all ecological communities are managed for biodiversity conservation. Assess sites relative to priorities at broader scales. Enhance long term viability of ecological communities. Assess sites according to their viability. (For more on biodiversity, see EIANZ ecology Position Statement on Biodiversity). Biodiversity values, as defined in the Threatened Species Conservation Act 1995 - Biobanking Amendment 2006 "includes the composition, structure and function of ecosystems, and includes (but not limited to) threatened species, populations and ecological communities, and their habitats." Biobanking better guarantees the protection of rare remnants and ensures that investment in offset / compensation is used to create measurable outcomes in areas where the effort will not be wasted. The measurement of biodiversity is based on the Biometric system. Because biodiversity is defined in holistic terms, rather than just threatened species, the focus is on the landscape and focuses on ecosystem integrity. The method has been structured to have maximum benefit for the range of species and measurement parameters include such things as site condition, connectivity, regional, state and national conservation priorities and threatened species, populations and communities . 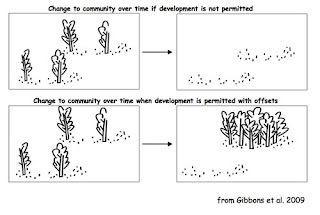 With limited exceptions , high biodiversity value communities cannot be developed if viable (red flag). Elsewhere, unavoidable losses in biodiversity from development can be offset. Trading in biodiversity credits is according to strict rules, in order to ensure that benefits are locked into the future. Management actions on biodiversity investment sites include managing grazing, weeds, fire and human disturbance; retaining regrowth, dead timber and rocks; replanting / supplementary planting; control of feral species, nutrients and erosion. All this is done to increase the area, condition and connectivity of threatened species habitat and other biodiversity values .